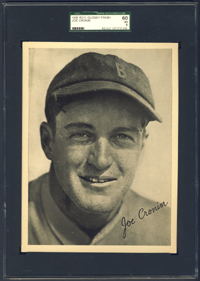 For 50 years, Joe Cronin excelled as a player, manager and executive. A hard-hitting shortstop, he made baseball history in 1934 when Red Sox owner Tom Yawkey purchased him from Washington owner (and Cronin's uncle-in-law) Clark Griffith for $225,000. 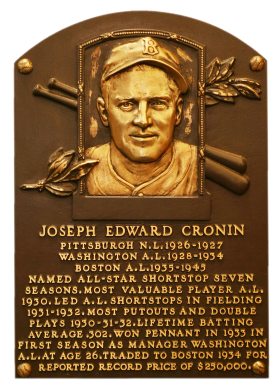 Cronin was a .301 career batter, and he had 1,233 runs scored, and 1,424 RBI to go with his 515 doubles. As a manager, Cronin led the Senators to a pennant in 1934 and the Red Sox to one in 1946. From 1959 to 1973, he served as Al President. Comments: A 1941 Play Ball PSA 6 was the first portrait card of Joe Cronin I purchased. In September, 2006 I decided to replace it with a 1936 R311 Glossy card. I found a VG raw example and thought it was the perfect image. In January, 2007 I purchased another copy hoping for an upgrade but it turned out to have a slight tear that I didn't see in the auction scan. In June, 2008 I won another example via eBay. Again, the copy was no better than VG. I kept searching. Then, in January, 2010 I was shocked when a seller on eBay advertised their auction for a "MINT" example. I took a chance on it. It wasn't mint but still the nicest copy I'd seen in 5+ years of searching. 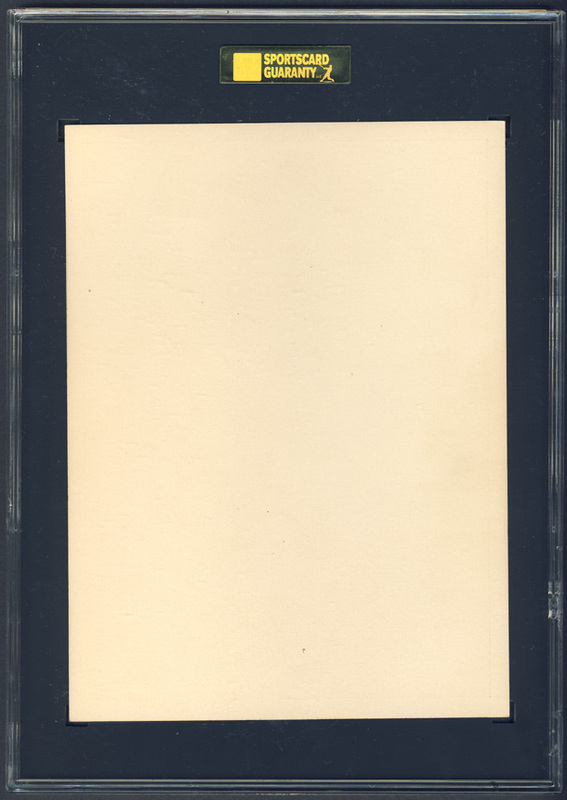 If not for a light fold, caused by mishandling the photo, the card would easily grade NM. I submitted to SGC and they graded it EX. I love this item - great condition and I'll most likely never find an upgrade. Description: The cards in this 28-card set, which was available as a premium in 1936, measure 6" X 8" and were printed on a glossy cardboard. The photos are either black and white or sepia-toned and include a facsimile autograph. The unnumbered set includes individual players and team photos. The Boston Red Sox team card can be found in two varieties; one shows the sky above the building on the card's right side, while the other does not. Some of the cards are scarcer than others in the set and command a premium. Babe Ruth is pictured on the Boston Braves team card.